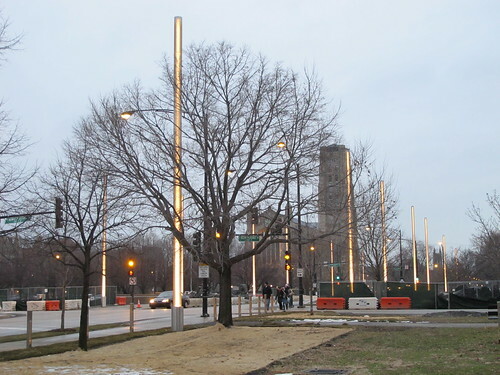 In architecture—and especially in warm, sunny locales like Southern California—light is a double-edged sword. Successful daylighting reduces dependence on artificial lighting and enhances occupants' connection to the outdoors. But the solar gain associated with unregulated natural light can easily negate the energy savings effected by replacing electric lights with sunshine. As leaders in the field of high-performance building envelope design, James Carpenter and Joseph Welker, of James Carpenter Design Associates (JCDA), are no strangers to the benefit-cost balance of designing for light. Carpenter and Welker will draw on their firm's extensive portfolio of both civic and commercial projects for "Light in the Public Realm," the morning keynote address at next month's Facades+ LA conference. 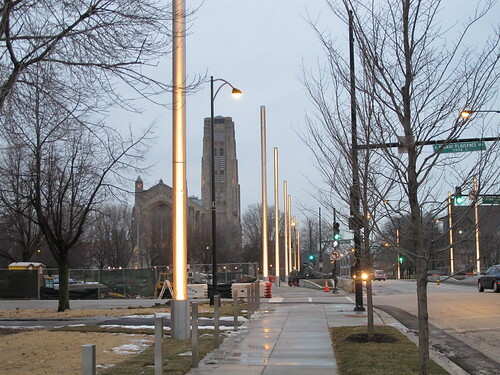 "We'll talk about the approach we have to light—how you use light for the occupant, and for the public realm," said Carpenter. "It obviously has technical components, like cable walls and curtain walls. But the thread might be less about a purely performative agenda and more on performance and aesthetics together." 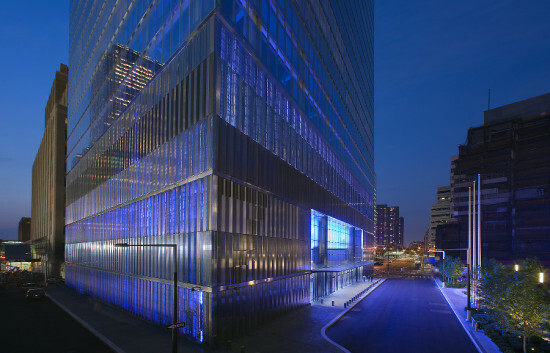 JCDA's notable facades include two joint projects with SOM, 7 World Trade Center and the Time Warner Center atrium, both in New York. 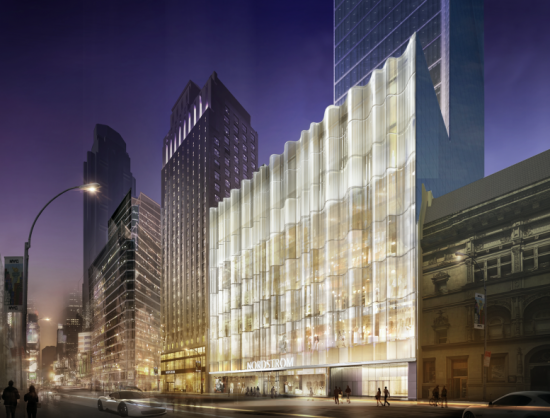 For 7 World Trade Center, the firm was tasked with integrating the glass tower and concrete podium. 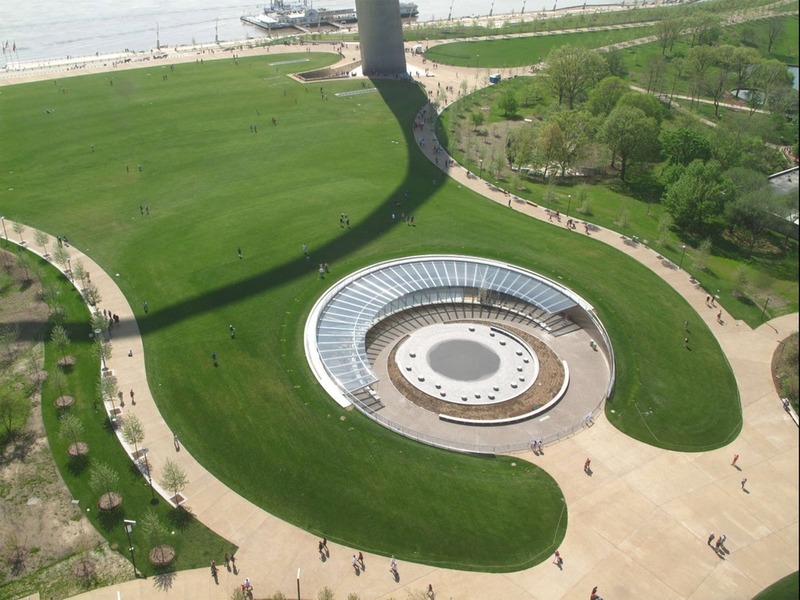 By floating vision glass in front of a stainless steel spandrel panel, the architects encouraged the play of light on the tower facade, creating an ever-shifting dynamic that blurs the line between building and sky. In the case of Time Warner Center, JCDA designed the largest cable-net wall ever constructed, and achieved the remarkable feat of hanging two cable-net walls from a single truss. To hear more from James Carpenter and Joseph Welker on JCDA's approach to light and the building envelope, register today for Facades+ LA. More information, including a complete schedule of speakers and workshops, is available online. 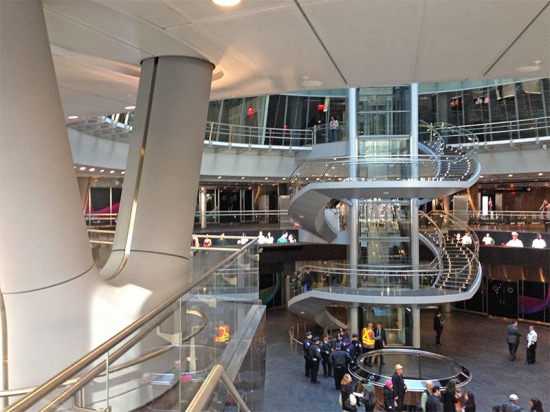 Earlier this week, AN went inside the recently completed, $1.4 billion Fulton Center in Lower Manhattan. As we mentioned, the station connects nine subway lines and is centered around a real show-stopper of an oculus. That massive skylight is wrapped in the Sky Reflector-Net, a 4,000-pound, James Carpenter–designed, structure that uses aluminum panels to disperse light throughout the station. Check out the video below to see how the MTA strung-up the high-tech net. When the new Fulton Center opened this weekend—after seven years of delays and cost overruns that lifted the project’s price tag from $750 million to $1.4 billion—New York City got two things: a modern upgrade to its transportation network and an iconic piece of architecture. With new well-lit concourses, pedestrian tunnels, escalators and elevators, and more intuitive transfer points between nine subway lines, Fulton Center will drastically improve the transit experience for the 300,000 people who pass through it every day. But even with these significant improvements, all anyone is talking about is the center's eye-catching glass oculus and its hyperboloid Sky Reflector-Net installation. Step inside the station, and you'll understand why. The 53-foot-diameter structure was commissioned by the MTA Arts & Design program and created by James Carpenter Associates with Grimshaw Architects, Enclos, TriPyramid Structures, and ARUP. 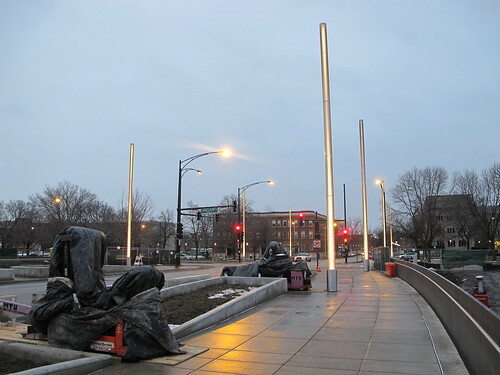 It is comprised of 952 aluminum panels, 224 high-strength rods, 112 tension cables, and 10,000 stainless-steel components that work in tandem to fill the station with natural light. 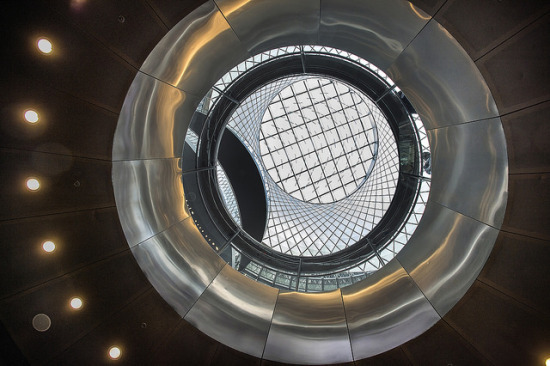 The full effect of the design can only be experienced from within the station—standing across the street from Fulton Center, which appears as a steel and glass headhouse, the oculus and Sky Reflector-Net could be mistaken for a massive vent. The upper floors of the rotunda, which are set directly underneath the oculus, will soon be ringed by shops and restaurants. The 66,000 square feet of commercial space is connected to the station through a prominent glass elevator that is wrapped in a spiral staircase. But as dramatic as all of these large gestures are, the center is completed with the MTA's standard-issue, black and gray finishes. The handrails, doors, flooring, and even garbage cans are what you would find at any other station. The station's subdued color scheme, though, is broken up slightly with the light blue glass tiles that clad the station’s below-grade corridors. In these subterranean spaces, the choice of tile, and the decision to set overheard fluorescent bulbs at an angle, shows the impact that designers can have when deviating—however slightly—from the norm. Spread throughout the new Fulton Center are over 50 digital screens that make up the MTA’s “largest state-of-the-art digital signage media program.” When AN visited the Fulton Center, some of those screens were quickly switching between video art and ads for Burberry. And then back again. The completion of the Fulton Center also comes with the $59 million renovation of the adjacent, 125-year-old Corbin Building. The refurbished space, which boasts a stately exterior, is incorporated into the circulation of the center. Exiting through the Corbin Building–side exit, you can see the wings of the nearly $4 billion, Calatrava-designed World Trade Center Transit Hub. When that station opens next year, it will connect to the Fulton Center, and quite likely overshadow it. The bulk of the funding for this project ($847 million) came from a Congressional appropriation which was aimed at rebuilding transit networks in Lower Manhattan after September 11. An additional $423 million came from President Obama's stimulus act. The MTA also provided $130 million in funds.